In this excerpt from my book, Digital Relevance, I discuss the need for marketers to re-discover the beauty of conversation and how it translates into more relevant online engagement with buyers and customers. Conversational competency is a content marketing application that drives social relevance. “Social relevance is based on conversational competency. Rather than a broadcast approach which is based on traditional “push” methods, social relevance is about context and idea expression. Conversational competence is the difference between posting a title with the link to a blog post without any additional context vs. posting a relevant reason for your audience to read the post with a link to it, for example. Heading back to his office from the break room, Dave sees his colleague, George, walking down the hall. What do you notice in the thread of this conversation? A conversation is actually built on a series of questions and answers. It’s a back and forth exchange that connects the dots throughout the thread of the discussion. A conversation creates a more fluid experience for both parties based on increasing the relevance with each exchange. When applied to a marketing context, the question and answer format of the “conversation” can be conducted over the duration of the buying process. Once the prospect becomes a customer, the conversation shifts, but it still continues. The tricky part of creating a conversationally-driven thread that engages your audience is in integrating the channels in use to create a consistent and progressive experience over time. According to research conducted by McKinsey & Company, “56% of all customer interactions happen during a multi-event, multi-channel journey” and “38% of all customer journeys involve more than one channel of interaction.”[i] While this research focuses on a customer experience, rather than a prospect experience, the IDG Customer Engagement Study found that an average of eight informational assets are used to aid decision making during the purchase process, accessed as the prospect completes each stage. [ii] These findings help to make the case for the integration of touch points and the need to eliminate the one-off, one-way mentality of traditional marketing approaches. Digital channels with easy access make connecting the dots for your buyers even more important. 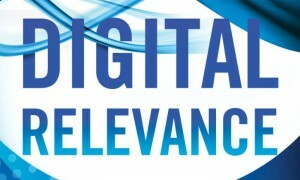 Marketers need to understand that social relevance isn’t just for social media applications. Whether within a single channel or across a number of them, social relevance is about connecting the story and ensuring consistency of experience, even as context shifts. For example, creating a dialogue can be done successfully on websites by guiding visitors from one content resource to the next based on a topical thread or a problem-to-solution path. A lead nurturing program constructed as a serial “story” can also establish an ongoing dialogue with each touch point added over time. And, yes, exchanges on social media can add depth and richness to the content shared to help build engagement and relationships if addressed as dialogue, rather than broadcasts. Imagine that you receive a nurturing email from a company whose expertise you respect. You click to read the article the email directed you to on the company’s website and then you see a link to a blog post. You click the link to the blog post, enjoy that it extends the topic in the article and see that the company is hosting a webinar on the subject. You click to register and it’s immediately clear that the topic you’re interested in is represented. You learn an additional fact in the bullets included in the abstract about the webinar that you had a question about. This added insight convinces you to register to attend. In the above example, your experience was fluid, easy to follow and increasingly relevant. Each step made sense, given where you were the step before. This scenario is an example of “conversational competence.” While it may sound simple, the reality is that in many companies, there would be three different teams working on this content. What are the chances that the experience will even be connected, let alone conversationally competent?